1954 Chris Craft Corsair "Legacy"
This restoration project is the culmination of a life long dream of a father and 2 sons who had always wanted to own a classic wooden boat. We found this particular vessel in the summer of 1997 in Mobile, Alabama. The boat was sitting on the bank, having been rescued by the marina 2 years earlier after having sank in her slip due to neglect of the previous owner who gave up on her. Well, we bought her for $2500.00 from the marina and quickly developed a reputation of being a bit crazy by the local staff and residents for undertaking such a huge project. After 6 months we had made believers out of most everyone due to our fast work and resourcefulness, despite a limited budget. Pure amazement is the best way to describe everyone's reaction when my brother, a mechanical engineer, and father were able to run both engines 2 weeks into the project! Well, turns out the engines were about the most solid part of the boat and basically everything else needed major reconditioning or total relpacement. We launched Legacy on September 17, 1999 after 2 years of dedicated work. 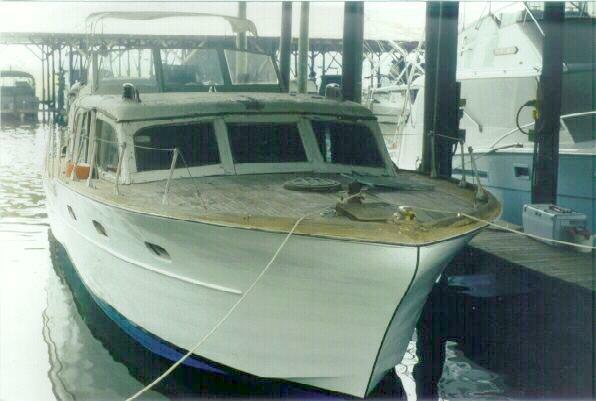 We still have a lot of work to do to the cabin, but she is now seaworthy and we are happy. Be sure and check below to view some great pictures of Legacy being restored, plus the colorful history section is a combination of unique and tragic events spanning over 40 years. We would also like to give a huge honorable mention to our wives: Line, Amy and Nancy Fleming. They sacrafice us to this project most every weekend and endure countless hours of listening to our never ending boat discussion. Thanks! !